Shikoku is one of main islands of Japan and composed of 4 prefectures with varieties and their attraction, namely Kagawa Prefecture famous for “Udon” needle, Ehime Prefecture famous for “Dogo Onsen” (hot spring), Kouchi Prefecture having a home town of “Ryoma Sakamoto” (a famous hero during Meiji Restoration and Tokushima Prefecture famous for the “Awa-Odori” (a local festive dance). There are many touristic spots but in this issue we would like to introduce you various events held in Shikoku such as festivals, art events, sport events, etc. 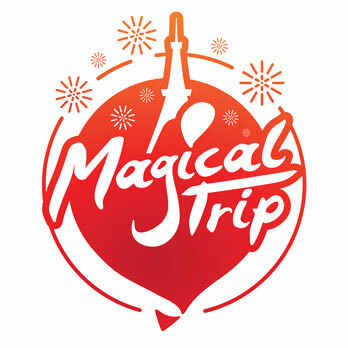 You can participate while sightseeing. 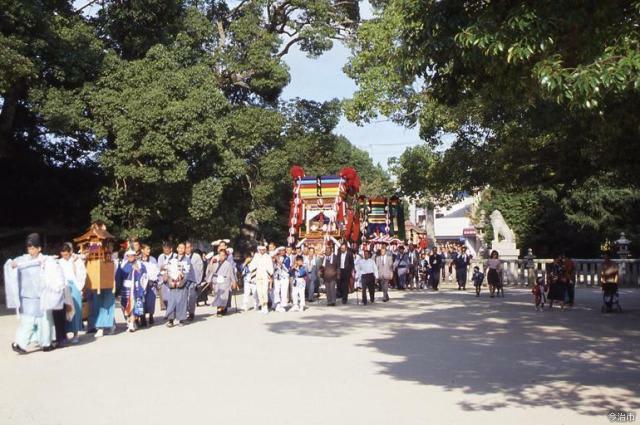 “Kikuma Matsuri” is held at the Kamo Shrine in Imabari-City, Ehime Prefecture. 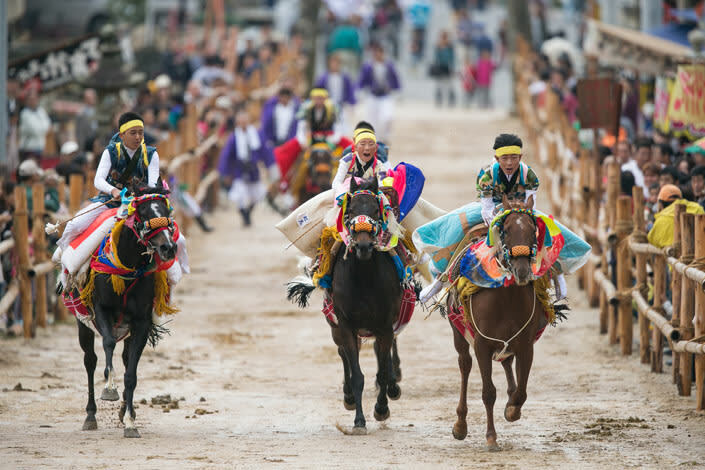 Other than “Mikoshi” (carrying a portable shrine) and “Shishimai”(a lion dance), the high-light of the festival is “Otomo-uma Hashiri-komi” (a festive horse racing). Boys in kimono tucked up their sleeves with a cord, ride a horse mounted with a saddle and a cushion dyed by “Yuzen” (a traditional Japanese dyeing technique). They run through the horse track of 300m in the shrine shouting “Hooy-ah, Hooy-ah”. The decorated boys running together with horses with a sound of bamboo lash is so intense and magnificent. It was designated as Intangible Folk Cultural Property” of Ehime Prefecture in 1965. “Otomo-uma Hashiri-komi” has been carried on for around 500 years in the Kikuma festival to pray for the safety of the family and the abundant harvest. Let’s enjoy the reviving historical scene with your own eyes. Around Kamo Shrine, you will find the “Kawara” Museum (a roof tile museum) that is the only museum for roof tiles in Shikoku-Chugoku region and exposes old and rare roof tiles around Japan, materials related to roof tiles, and the works by artists born in Kikuma town. Also you will find Kasen park famous for autumn color leaves. Promenades around the area are highly recommended. Oyamazumi Shrine is the Grand Head Shrine of ten thousand of Yamazumi Shrines and Mishima Shrines throughout Japan, and the oldest shrine in Ehime Prefecture. There stands a big camphor tree presumably 2600 years old, in the middle of the shrine precinct. The shrine has many important cultural properties such as “Honden” (a main hall) and “Haiden” (a worship hall). You will experience a mysterious and timeless ambiance. People worship as God of the sea, God of the mountains and God of the worriers. Many worriers dedicated armors to pray for victory in battles or to give thanks for the victory. The museum in the precinct possesses those armors which count 80% of those designated as important cultural properties throughout Japan. Among them you can see armors dedicated by famous worriers like Yoshitsune Minamoto, Yoritomo Minamoto and others. You can feel historical heroes close to you. “Ubusuna Taisai” (“Taisai means a grand festival.) is a festival to thank God for the peace and security of the nation, the marine safety, the prosperity of the people, and to celebrate the increase of productions. It is held on a Sunday closest to 22nd August of the lunar calendar. The climax of the festival is a procession through 4km by 3 portal shrines followed by “Shishi-Gashira” (a head of the lion), “Shishimai Jinyaku” (a lion dance performer) and accompanying people wearing traditional colorful costumes of the Heian through the Yoshino Era. This picturesque and very Japanese festival is a must see event. “Kure Hachimangu Shrine Shuki Taisai “ (Autumn Grand Festival) goes back to the Civil War Era, and it is one of 3 major festivals of Tosa. Among fantastic attractions you should not miss “Omikokusan” (Holly harvest festival) and “Kenka Daiko” (Fighting drums). “Omokokusan” is a procession through the town, starting at 0:00a.m. 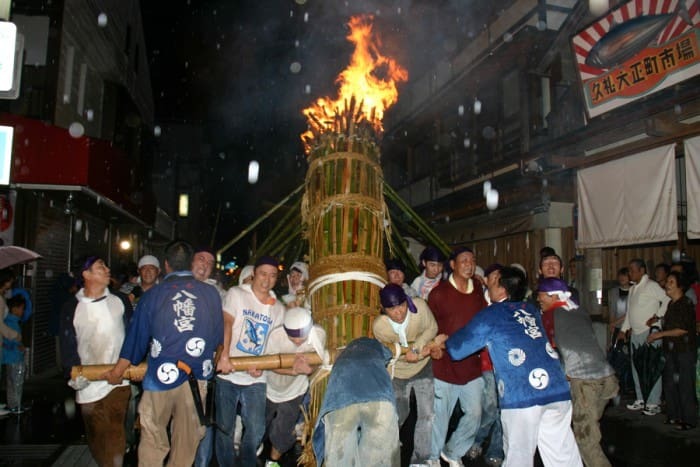 on 3rd (Wednesday) midnight in October, carrying a big torch (6m high and 1t weight) and 12 small torches. “Kenka Daiko” is a completion among big Japanese drums coliding each other. On 4th (Thursday)a parade of the portal shrine proceeds from “Hachimangu Shrine” to “Otabijo” (a temporary shrine) in the sea. Many visitors not only from the prefecture but also from other prefectures come to the festival even in the midnight. You can feel a gallant ambience of Tosa. The first day of two days festival, you can enjoy fireworks at night. Kure Hachimangu Shrine is designated as a tangible cultural property of Kochi Prefecture. Though it has existed here for many years, the present shrine was reconstructed in 1825 in the form of late Edo Era. You will appreciate the building itself of the shrine. “Omikoku san”: 3rd October from 0:00a.m. Eve of Festival: 3rd October from 6:00p.m..
Fireworks: 3rd October from 8:00p.m..
“Rei-taisai” (grand festivals): 4th October from 10:00a.m. “Obanare” (processions) 4th October from 3:00p.m..
At the same time as of “Kure Hachimangu Shrine Shuki Taisai” (an autumn festival) there are fireworks. The fireworks take place in the evening of the first day of two days “Kure Hachimangu Shrine Shuuki Taisai” that is one of three major festivals in Tosa (Prefecture). 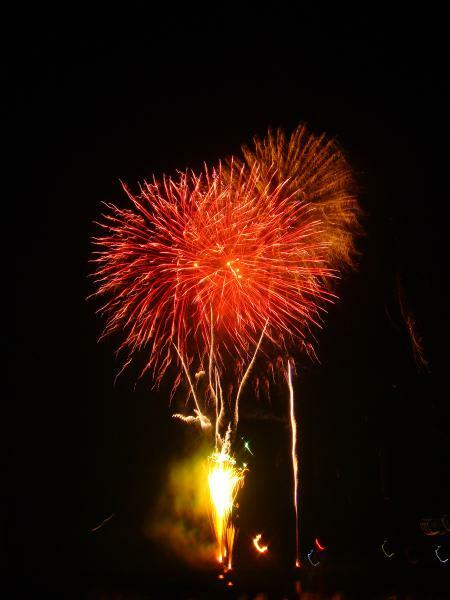 The venue of the fireworks is the “Furusato” beach in front of “Kure Hachimangu Shrine”. More than 2000 fireworks like skyrockets in the night sky would fascinate the spectators. The “Furusato” beach hosts not only the festival but also local triathlons. The beach is for the local people to promenade in the morning and at dusk. From the beach you can view “Futanajima” island, the landmark of Tosa. It is said to be the power spot where you will be energized by the powerful sunrise. It’s now time to cool down yourself on the beach with the fireworks after your excitements of the festival. By the way, ”the Prefecture of Bonitos” means Kochi Prefecture. People in Kochi have been eating bonitos for more than 2000 years. It is an advantage of Kochi being close to the sea where bonitos are abundant, because they are easy to go bad fast. Therefore, Bonito is used for the title of the festival. Why not try fresh bonitos of Kochi after the festivals and fireworks. 3rd October, 2017 from 8:00p.m.. The “Evening of Moon Viewing” is held at “Tokushima-Jo Museum” celebrating the Harvest Moon. In September, there is “Kangetsu Chakai” (Moon-viewing Tea Ceremony) with the setting celebrating the Harvest Moon, by Tokushima branch of “Ura-Senke Tankoukai”. In October “Kangetsu-Noh” (“Noh” play at night under the moon light) will be held to enjoy “Shimai” (an informal dance) and “Utai” (a chant). It is a good opportunity to experience the traditional Japanese culture. Tokushima-Jo Museum is situated at the site where the Tokushima Castle used to stand. The usual exhibits consist of 5 themes in lights of the relationship between the domain of Tokushima and the Hachisuka Clan: the political history of the domain, the culture and life of “Daimyo” (feudal lords), the structure of the castle and “Awa Suigun” (Awa Navy). Also many varieties of events are held there such as seasonal tea ceremonies (ex. Tea Ceremony of flowers or “Tanabata” star festival), Karuta tournaments, exposition of Noh masks. Moreover, around the Tokushima-Jo museum you can visit tourist spots such as “Tokushima Chuo Koen” (a park) with a rose garden, the garden belonging to the former Tokushima Castle official hall and the Awa Dance Hall where people enjoy Awa Dance throughout the year. “Kangetsu-Noh”: 15th October, 2017 From 1:30p.m.. to 4:30p.m..
“Yokaichi Machinami Kangetsukai” (a moon viewing) is held at Uchiko-Cho, Ehime Prefecture at the time of harvest moon in the autumn. The quarter for the event is designated as the Gokoku preservation zone for the important traditional buildings. Uchiko-Cho is situated in the “Nanyo” region of Ehime Prefecture. The town has been trying to preserve the houses of merchants who made fortune in the trade of wax trees. This will bring you some nostalgia. In this event, the preservation zone (about 600m long) in Gokoku quarter is lightened up by hanging paper lanterns or bamboo lanterns that the residents made by the hand. With those lights the quarter will have fantastic atmosphere. You feel like as if you were in a scene of the movie. The illumination is also seen in the garden of Kamihaga Mansion which is a museum of the Japan wax and is designated as Important Cultural Property. There are concerts in the museum, and music plays by Japanese harp and “Hazetori” dances in the houses. “Hazetori dance” is a song and dance while making the Japanese wax for candles in late Edo Era through Meiji Era. The wax trees made Uchiko-Cho prosperous. At the public square you can have a bite of “Tuskimi Dando” (a dumpling) made by the ladies of the preservation association. It is recommended to spend relaxing time with the light-ups and the dumplings in Uchiko. 3rd – 4th October, 2017, from 6:00p.m.. to 9:00p.m.. The customary event in Noichi takes place. “Noichi de Night” is popular every year. At the Noichi Zoo there are 1000 animals of 110 species kept. The zoo is divided to zones: the Temperate Forest, the Tropical Forest, the African Zone, the Australian Zone and the Jungle Museum. Each zone preserves real habitual environment for the animals. Among them, the Jungle Museum which recreated to the full-scale tropical rainforest, was ranked the tenth place in 2011 in the category “Zoo to understand the ecology” by Nihon Keizai Shimbun. The zoo has a basic idea of “Humans and animals, full of life together!” and is trying to keep animals in a natural environment as much as possible. In the event, the hours are extended to till 9: 00 p.m. So that you can see animals’ behaviors at night, which cannot be seen during the day. In addition, from this year projection mappings and illuminations are held at two places in the zoo. Let’s take this chance to observe the active behavior of animals and the ecology in the night. ※Open on 13th August (Sun), 17th September (Sun), 23rd September (holiday) and 8th October (Sun), No postponement for rain but will be closed due to Typhoons or Bad weathers as the case may be. “Tobe-yaki” Traditional Industrial Center is the only facility where you can learn the history of “Tobe-yaki” (Tobe ware). The historical documents, display panels showing the manufacturing process and excellent works are exhibited there. On the 2nd floor, exhibitions are held about eight times a year so that you will not get bored every time you come. A giant globe called “the blue star of life”, weighing 300kg with a height of 160cm, is displayed at the lobby on the ground floor. It is an identical to the one donated to the headquarters of the United Nations. Sometimes there are sales and exhibitions held in the lobby. The Exhibition by the Association of Traditional Craftsman is held in such “Tobe-yaki” Traditional Industrial Center. It has a history of about 240 years. You can appreciate the charm of “Tobe-yaki” designated as Intangible Cultural Property of Ehime Prefecture and as traditional crafts of the country. I wonder if you can feel the charm and possibilities “Tobe-yaki” created by 15 traditional craftsmen who represent the art of “Tobe-yaki”. There are many spots around worth visiting. “Tohan-no-michi” is a road with a total length of 500 meters placed tiles of “Tobe-yaki” everywhere. “Tosoga Oka” (a hill) where many statutes dedicated craftsmen who contributed to “Tobe-yaki” are standing, commands a great view of the village of “Tobe-yaki”. Let’s walk around the area. 16th September,2017 – 12th November, 2017 9:00a.m. – 5:00p.m..
Rafting is an exciting outdoor sport that goes down the torrent with a rubber boat called raft. Commercial rafting for the general experience began in Japan in early 1990’s, and since popularity has been increasing as a sport through which people can enjoy the great nature easily, regardless of the age. Around 40,000 people participate annually in “rafting” which is a big attraction of experiential sightseeing, and many people enjoy torrent and river trips. In October 2017, the world’s top athletes will gather here this Yoshino River to compete for the world No.1 of the race rafting. Race rafting is a sport where four or six people ride into a boat and compete for how quickly and accurately they can descend the torrent. To win the race you should get the highest points in 4 races: Sprint (short-distance time trial), H2H (short distance race with simultaneous start by two boats), Slalom (Pass the gates in the designated order and competes for time) and Down River (3 or 4 boats start by one race and compete for the shortest time in the long distance). Participants from the leading countries compete in Yoshino River, the best rafting spot in Japan. Since there is a free shuttle bus is available for spectators, why not enjoy the rafting world championships held in Japan for the first time. Yusuhara-Cho is a town known for the patriotic samurais during the Meiji Restoration who initiated the dawn of Japan. They left their domain “dappan” and were active in this town. Here in Yoshihara-Cho, a marathon tournament is held while you can enjoy running and the rich nature. The event has three courses, full marathon, half marathon and mini marathon for 10 km. A small festivity is held on the eve of the marathon after the episode of Ryoma Sakamoto (a fee required for participation). The story goes that Ryoma stayed in the town and had a drink on the eve of crossing the frontier of the domain. Even if you do not run in the marathon, you can go around the town. Entries have already ended, but why not stroll around this town with your runners while cheering them?